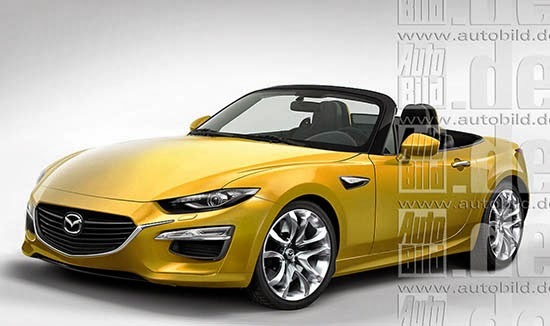 It's sort of risky making the Miata resemble the S2000. As awesome as the S2k was, it didn't really sell well. This looks more fussy than classic...trying too hard to look different. 2-seater convertibles do not sell well because they are small, noisy, impractical, and you need to be in the right geography and climate. Americans are getting bigger. Hell they do not fit even in Suburbans any more. They appeal more to the midlife crisis crowd that cannot afford a corvette. This looks great. I have to say Mazda has the most beautiful line-up of cars now. Not overdone like Hyundai, Infiniti and Nissan, or as trendy as Ford, but liveable design which looks good now and will age nicely. Even the next version of the Mazda 2 is sharp. I am surprised there aren't more Mazda's on the road. I think the Mazda front end looks terrific on the Miata. Don't know what or when Mazda will wreck this grille treatment, but for now it's easily the best looking Fusion alternative. Let's face it... Honda's not going to give us s**t to replace any of its sporty cars, but certainly not an S2000. Look at their engines.... no high rev'ing VTEC, smaller displacement, cheaper mechanicals. Mazda would be smart to capitalize on that for a new Miata AND an RX7. But they need to avoid the mistake they're making on their regular lineup (3, CX5 and 6)... which is terrible proportions and worse interiors.